The real benefit of a rotary tool comes from its applicability and appropriateness for small jobs around our homes and workshops. You might have purchased your tool for a bathroom grout removal exercise but that doesn’t mean its use has ended there. As a DIYer, you need a bit of imagination to figure out how you can get the most out of your rotary tool. I have compiled over 30 rotary tool uses and projects that you can accomplish with this versatile equipment. With this guide, all you need is your tool and the right accessories. I believe you purchased it with these attachments. Hence, no further spending. Always remember to turn off your tool and lock it when it is not in use, always! At some point in life, you will need to cut a small part of your home’s drywall. It might be a regular home remodeling task or when moving into new home. I have found myself cutting holes in drywall when patching or when creating electricity and water pipe outlets in new homes. A rotary tool will help you get the task done easily and smoothly. Note: You should wear eye and ear protection gear when cutting drywalls with rotary tools. Measure and mark the area that you need to cut. I always use my workman’s ruler and long clutch pencil. However, you can use any ruler, pencil, or pen for this task. In case you are doing a hole patching exercise, you should start by cutting the piece of wallboard that you intend to use in the repair. Cut a square piece that is a little bit larger than the actual area that you will be patching. Using the multipurpose cutting guide will help you get clean cuts along the edges. You should then use the square piece to outline the area that you need to cut on the drywall. After marking the area that you intend to cut, take your rotary tool and start making the actual cutting. In case you are cutting small holes for water pipes or electric wires (sockets), you can simply go ahead and fix the pipe before finishing with a joint compound around them. However, for patching, you might want to start by fixing a scrap wood or a strong tape on the back side of the hole. This acts as a support for the drywall patch by protecting it from “falling” backward as you apply the joint compound. Finish the whole process by applying a joint compound. You can use the side of a knife to push the compound into the gaps. Tip: I always repaint the entire wall after patching to give it a smooth look, such that nobody can notice the patching. You can also fix a piece of art or a wall-clock on the patched area! Home remodeling range from simple tasks like repainting your walls to complex activities like kitchen cabinets replacement. For smaller homes, this is a typical DIY exercise that you can complete within a day. The rotary tool comes handy when cutting pieces of woods, boards, and plywood. Note: While rotary tools are faster and convenient when cutting wood, you should steer clear of using them when cutting a lot of wood and very thick hardwoods. Place the piece of wood that you intend to cut on top of a clean working bench. In case of a metallic bench, consider laying a larger piece of scrap wood beneath the wood that you intend to cut. Measure and mark the area that you intend to cut. Ensure that the marking is clearly legible as the tool will produce a lot of dust when cutting. Wear your eye protection gear. In case your tool makes a lot of noise, you will also need an ear protection gear. Attach the wood cutting attachment to your rotary tool. You may need a wrench depending on your rotary tool. The wood cutting wheels are the best since they have been specifically designed for the task. Power on your rotary tool and start cutting from one end. I prefer starting at a lower speed and slowly power up the tool in the process. Tip: Avoid the temptation of forcing down the tool when cutting. All you need is to hold it and it will make the cutting without the use of force. Replacing your bathroom tiles has never been easy. From removing the grout to cutting the few pieces of tiles that you need to fix, a rotary tool will make the whole job easy for you. I find the tool ideal for cutting holes in tiles or making fine cuts on tile edges. Note: In case you intend to cut a lot of tiles, you may need a nose guard. Tiles produce a lot of dust. Use a ruler and pencil to measure and mark the line (or area) where you will do the cutting. Wear your eye protection gear and power on your rotary tool. Point the cutting bit or disc on one end of the cutting line. In case you are cutting a circle with a disc, tilt the tool at 45 degrees when cutting. Push the power button to a lower speed and slowly start the cutting as you power up to the highest speed. Let the tool do the cutting – steer clear of forcing the cutting bit on the tile. Tip: Avoid blocking the tools ventilation when cutting tiles. You might also want to regularly stop and pause in the process to clean the dust. A few decades ago, you could easily buy lumber to make a wooden flooring for your 1,200 sq. ft home. That is not the case today, timber has become very expensive and scarce. Common sense also tells us to protect the environment. Laminate flooring has substituted wooden flooring in the modern world. A rotary tool will help you cut laminate to your desired lengths, shapes, and styles. Tip: Cutting laminate flooring is very similar to wood cutting. So, anything you know about wood cutting applies here. Measure and mark the area that you intend to cut on the laminate flooring. In case, you are cutting ventilation holes on the floor, ensure that there are no nails within the area. Wear your eye protection gear. You will need gloves in case you are doing a lot of cutting. Attach the cutting bit and guide and adjust them to your desired length. Power on your tool and bring it to about 20,000 RPM – three-quarters speed for variable speed tools. Start cutting from one end. Always allow the speed of the tool to do the cutting for you, not your strength. Note: If you need to make perfect edges on the laminate, you can do it with the help of the cutting guide, once you are done making the actual cutting. I remember a time when I couldn’t access my basement garage after I lost my keys. The bunch had the only key to the garage. My rotary tool came handy when cutting the padlock. I have also used it when cutting nails, screws, and bolts. Note: Wear eye and ear protection gear, as well as gloves since there will be a production of sparks in the process. Plug in your rotary tool and hold it steady with one hand. The other hand should hold the piece of metal that you intend to cut. Ensure that you are letting the speed of the tool to do the cutting and not your strength. Tip: Don’t be confused by the side of the cut-off wheels, they are fairly tiny but very strong. Fiberglass has a thousand home uses. They can be used for swimming pools, hot tubs, roofing, molding, bathtubs, and pipes. In case you need to a cut a few fiberglass for a bathtub, the rotary tool will perfectly do the job. Clean your workbench and place the fiberglass that you intend to cut on top of it. Using a strong tape to tape it on the bench will make the cutting process easier and fun. Measure and mark the area/line that you intend to cut. Plug in your rotary tool on the socket (corded tools) and wear your eye protection gear. Starting by cutting a faint line along the length that you will be cutting is very ideal. Tip: Stop and pause to clean the dust when cutting. It not only helps in keeping your work area clean but also ensuring that you don’t lose track of your cutting line due to dust. So, you are doing some home remodeling works. You need to cut some vinyl siding for the corners and water hoses outlets to give your home beautiful aesthetic looks. I have been there before, while you can’t cut a hundred vinyl sidings with a rotary tool, the tool is perfect for just a few cuttings when renovating your home. Measure and mark the area that you intend to cut. Cutting vinyl siding is much like cutting drywall boards. Attach the multipurpose cutting bit and guide on your rotary tool. In case of circular cutting for ventilation, pipes, and similar things, be sure to use the circle cutter and straight-edge guide accessory if you have it around. You can still measure and mark a circular area and use the bit without the guiding attachments, but you might want to practice on a scrap wallboard or scrap vinyl siding. Power on your tool and start cutting from one end. In case you are using the circle cutter and straight-edge guide, drill a small hole at the center of the circle that will act the pivot hole. A rotary tool can serve as an alternative to a jigsaw when cutting and trimming plastics. You might be a hobbyist Modder, who likes modifying gaming consoles or kids’ toys or cases, or you just want to cut a few plastics at home. The tool will help you get the job done easily. Wear safety glasses and any other protective gear needed before using your rotary tool. Some tools make a lot of noise, you may need ear protection gear. Mark the areas you need to cut on the plastic. In case of trimming, mark how far you may need to go when trimming. Plug in your rotary tool on the socket, if you are using an electric rotary tool. Power on your tool and start cutting on one end. Using a slower speed when cutting plastic is ideal. Higher speeds make the cutting attachments hot, hence “melting” the plastic. If you intend to make circular cuttings, use the circle cutter and straight-edge guide attachment. Since this accessory comes at a cost, not all people will afford it. 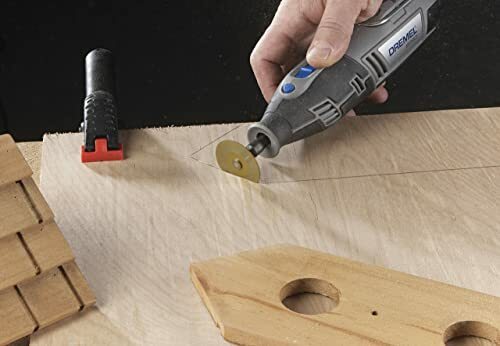 In such an instance, you can use your rotary tool at a 45 degrees angle to make soft touches on the edges of the circle that you intend to cut. In case of rough edges due to “melting” after cutting, use a sanding drum to smooth down the edges. Note: Avoid applying pressure when cutting. Just use soft touches, for the best results. Rotary tools are perfect for engraving wooden decorations like flower patterns, stencil letters, and words on pieces of woods like key chains, wall pieces, and similar art materials. I always find it fun trying out various artistic patterns on wood with a rotary tool in slow weekends. Note: Wear eye protection gear and safety gloves. The process involves the production of high amounts of dust. Pick a piece of wood of choice and make sure its surface is smooth. You might start by smoothening the wood with sanding drums. Design the pattern that you intend to carve. You will need to do it from a PC and then print it out on a paper. Approximate the area of the design on your pattern. Cut out the design from the printed paper, leaving a few millimeters from the edges – you will use the extended paper to tape it on the wood. The best way is to cut a rectangular shape that matches your piece of wood. Cut a similar size of carbon paper and use a piece of tape to attach it to the printed paper. Ensure the carbon side faces outside. Place the taped carbon paper and pattern on your piece of wood and tape them firmly. The carbon ink side should face the wood surface, while the pattern should be on the outer side. Use a pencil to trace the pattern slowly without applying a huge amount of pressure. You can repeat this, to cover up any mistakes. Peel off the carbon paper and pattern, such that to remain with the traced pattern on the wood surface. Wear your safety gear and power on your rotary tool. Start carving from the pattern outwards. Not the other way around. The process should be slow and precise. Use the sanding drums, in case you want to take down a huge amount of space. Tip: Changing from smaller to larger bits will make the whole process easier and fun. Whether you want to etch a butterfly pattern on your favorite wine glass or engrave some positive words on a glass material, a rotary tool will help you get the job done. All you need is some level of practice and patience. Diamond mounted bits for etching – they mostly come as a set. The pattern or words that you need to etch. Note: You should wear protective gear when etching, especially goggles. Design and print out the pattern that you want to engrave on your piece of glass. When designing, ensure that the pattern will fit in the area that you intend to perform the etching. Fix the pattern on the inner side of the glass. This can be simply done with the help of a tape, such that the pattern faces the outer side of the glass. Make sure it perfectly holds in place. Fix your preferred etching bit on the flex-shaft attachment and power on the tool. You should start with the smaller bit to make the outline and proceed to the bigger size to fill the details. As you work, use a piece of cloth to clean the glass surface. Using a medium speed will bring a whole lot of fun and precision in the process. Tip: I always find myself changing the bits from time to time depending on the level of detail that I need. Remove the pattern and finish by soft touching the areas that you missed. Tip: Working in a well-lit area will offer you with a higher precision and accuracy, thus avoiding mistakes. You can accomplish decorative designs on tables, desks, and anything constructed of wood with carving bits and a bit of practice. Engraving on furniture, unlike carving on pieces of wood, means that you can’t undo your mistakes. Here you are dealing with real craftsmanship! Carbon paper, scissors, and tape. Note: Every step is similar to that of carving on wooden surfaces. The only difference is the precision and care needed when dealing with furniture. Identify your furniture of choice and make sure its surface is smooth. In most cases, the surface will be already smooth. Design the pattern that you intend to engrave. Remember, you will be engraving the letters and patterns, so you are cutting them down, as opposed to carving where they will appear to be above the surface. The process should be slow and precise. You can use the same process to engrave your name or initials on your tools. In case of metallic surfaces, use a bit that is meant for metallic surfaces. Tip: If you are unable to access carbon (graphite) paper, you can use the blackboard chalk on the back side of the paper with your pattern. Rotary tools are perfect niche sanders for intricate details on wooden furniture. All you need is a sanding drum. They come in different sizes and shapes. In most cases, your tool will be equipped with sanding accessories when purchasing. Sanding sleeves of various grits. Clean the surface that you intend to sand. You might want to use an old rug, but avoid anything wet or dampened. Attach the sanding drum mandrel attachment on your rotary tool. Depending on your tool, you might need to use a wrench in the process. Follow up by fitting the sanding sleeve of your choice and lock them in place. Note: Sanding drums come in different shapes and styles, some are old-school and need screwing, while others come as a plug and push kit. You should consult your buyer’s manual on how to fix them on your rotary tool. Plug your tool into a socket, for electric tools, and then power it on. Start by sanding at a low speed and power up to a medium speed. You should keep changing the sanders depending on how smooth you want to make the surface. When sanding edges, tilt the tool to about 45 degrees and softly sand them from one end to another and back. There are cone-shaped sanding drums which are specifically designed for edges and hard-to-reach areas. Clean the dust with a rug or old cloth as you sand for the perfect results. The average DIY home builder will find himself molding various things at least once every year. They can range from shoe molding to crown molding. The latter is a bit complex. 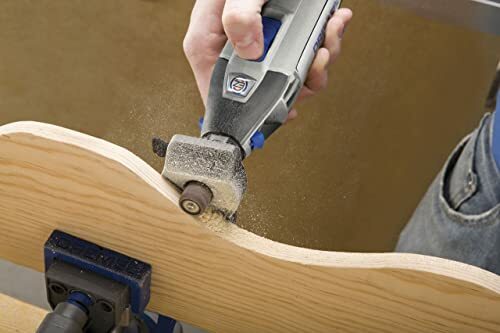 Rotary tools when used with a sanding drum are a nice alternative to using a saw when fine trimming and coping the corners and edges. Place one piece of molding perfectly into the corner that you want to trim. Cut the opposing piece at a 45-degree miter. Proceed by sanding away the material exposed by the miter cut. Using an aggressive sanding drum (with a rougher grit), will make the whole process easier and fun. Pause and check how the piece fits, once most of the material exposed by the miter cut has been removed. You should carefully remove material from the later stages of coping. Check the fit of the piece frequently as you sand. I find myself switching between sanding drums of various grits when sanding moldings. With the help of a more advanced sanding accessory, it is just a matter of plug and push. That is unlike the old-school sanders that needed the use of screwdrivers, small hummer, and workbench. Well, rotary tool’s sanding wheels are perfect for grooming your pets. I know this might sound a little bit crazy, but there are tens of real videos online of other DIYers who have done it. All you need is your rotary tool and some sanding drums and you are good to have well-trimmed and groomed dog nails. A sanding drum mandrel and sleeve. Note: If your tool came with just a single sanding drum, it will still work. So, no need for panicking! Start by wearing your eye protection gear. They are very important whenever you are working with a rotary tool. Your regular sunglasses will still suffice. Hold your pet with one hand, like a baby, and the tool on the other hand. Once your pet is comfortable in your hands, power on your tool and start trimming his nails one by one. Start with a lower speed to three-quarters speed for a variable tool. When trimming, hold the tool at 45 to 60 degrees, and focus on smoothening the nails rather than “finishing” them. You should pause before moving from one nail to the other, just to give your pet some few minutes to relax. Tip: If you are really friendly with your pet, he will let you trim the nails while he is laying somewhere. There will be no need for holding. Alternatively, you can get help from a close friend or family member. Unlike dogs, trimming cat nails is not fun when the process is introduced to older cats. You need to start when the cat is still small. He/she needs to grow with the practice. Rotary tools are perfect alternative for cat’s nail grinding. Start the process when your pet is still young. You can touch his paws, massage them, or just place the tool on them without powering it on. You want him to get used to the tool first. Learn the anatomy of your pets. A cat’s toenail has a nerve and blood vein – called a quick. Any mistake or grinding into the quick will result in bleeding and pain. Introduce the tool slowly and gradually. For example, you can start with one toenail and add another one weekly. Such that in the third week, you will be grinding three toenails. Power on the tool, and use the lowest speed. Trim the nail that is curling downwards such that it is even with the paw pad. That is, anything that hangs should be clipped off. Handle the process with care and caution. In case you accidentally hurt your pet by grinding into the quick, call your veterinarian immediately. Tip: Ensure that your cat is sitting comfortably. In case he doesn’t like it, stop and try when he is “willing.” You can put him on your laps and trim the nails as you massage him. 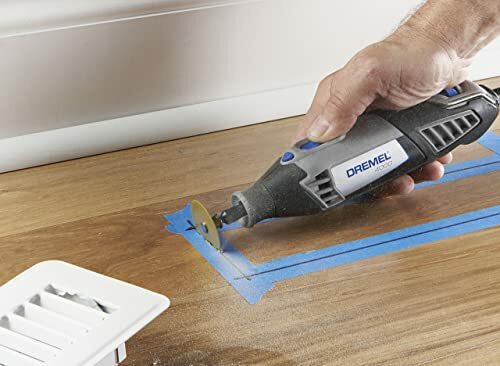 I just purchased a new Dremel. The last one I had was from years ago. The one problem was keeping track of the attachments and what each one did. As anyone come up with a organizing solution for this? Any ideas? I could see a tackle box being handy for all the bits and parts. The bottom of the tackle box should be able to house the whole tool itself too.